Biomarkers can be a useful tool for measuring bait uptake, and animal movement. Pyranine is a non-toxic, short lived, fluorescent green biomarker that stains the intestinal tract of an animal, and is highly visible under UV light. As part of a trial in 2017 aimed at assessing rivers as natural barriers to possum movement, Zero Invasive Predators (ZIP) used aerially sown and ground laid non-toxic pyranine laced cereal pellet baits to mark a possum population in the Orongorongo Valley, Remutaka Forest Park. The baits were sown weekly (weather permitting) on the true right side of the Orongorongo River, and leghold traps were deployed on the true left side (which had a low possum density due to pest control operations) to catch any marked animals that crossed the river. Trapped animals were then dissected and examined for traces of pyranine consumption to assess their origin. Possums were also trapped uphill from the pyranine sowing zone on the true right side of the river to confirm marking and assess possum movement over land for the duration of the trial. A total of 82 possums were caught in kill traps on this trap line that displayed obvious signs of pyranine consumption in the stomach, intestines and rectal tract. 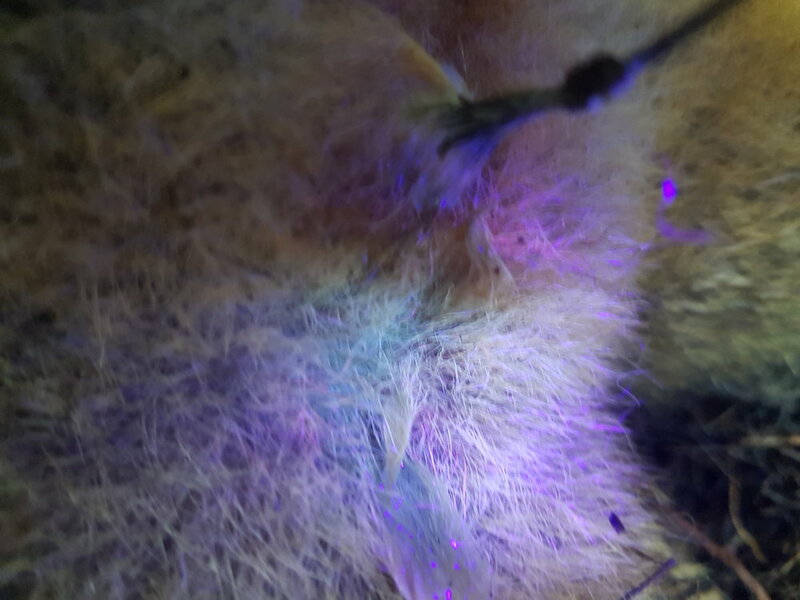 A total of 44 possums were caught along the true left side of the river, two of which were observed by fIeld staﬀ to have faint green ﬂuorescence under UV light on several external areas of the possums’ bodies. No pyranine traces were found internally in either possum. This surprising observation was the catalyst for pyranine feeding trials at the ZIP Predator Behaviour Facility at Lincoln, Christchurch, which aimed to (i) accurately quantify pyranine expression in possums both internally and externally, and (ii) identify the presence of any naturally occurring ﬂuorescence on the possums themselves. Trials investigating possums for both external and internal ﬂuorescence were carried out, comparing control possums to those who were fed non-toxic pyranine laced cereal pellet baits. Table 1 below shows the reduction of the internal pyranine detectability from 2 to 6 days after consuming 5 baits (n = 3 possums). 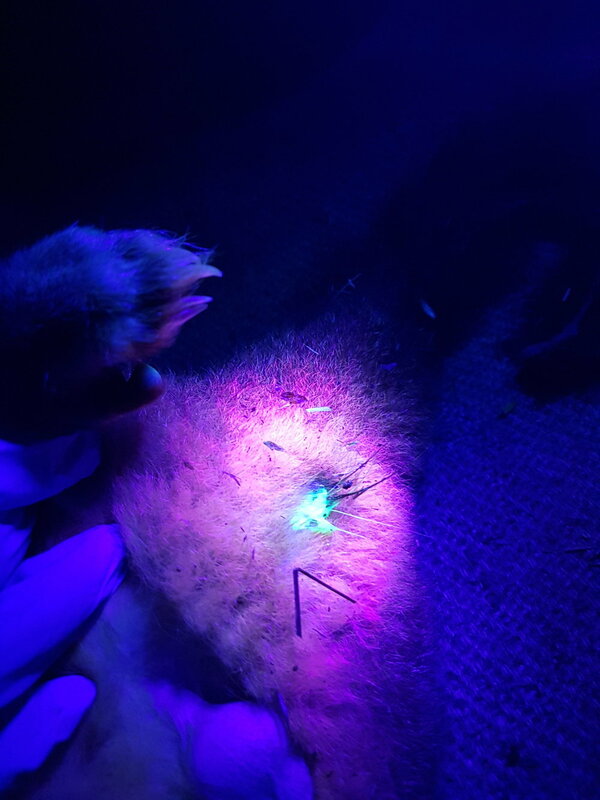 When several control possums were examined externally, natural green ﬂuorescence was discovered in the wrist fur, paw pads, whiskers and urine! 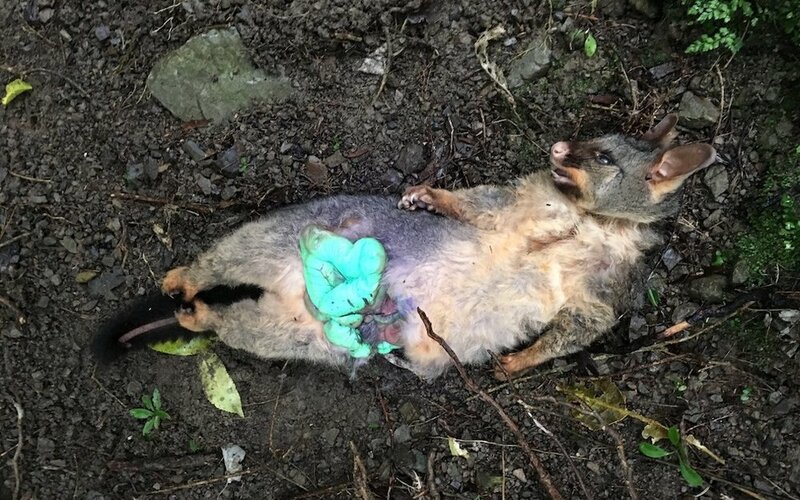 The urine especially could easily contaminate fur around the urogenital area and other parts of the body, providing a likely explanation for some of the faint green markings on the two ‘surprise’ possums in the Orongorongo Valley. As a result of these trials, ZIP was able to ascertain that the two ‘surprise’ possums in the Orongorongo Valley did not contain traces of pyranine. This meant that no marked possums were caught on the true left side of the river for the duration of the original field trial, indicating that the river was acting as a barrier to possum movement.